Dette sjarmerende steinhuset, ca 100m2 nylig renovert til en høy standard, er over 3 nivåer, hver med direkte vannutsikt. Hver av de to øverste etasjene har et soverom med sittegruppe / studie, et eget dusjrom og en sjenerøs walk in closet. Den øverste etasje soverommet har en king size-seng, mens den ene i første etasje har to enkeltsenger og en dag seng i den tilstøtende studien. I første etasje inneholder boligen et komfortabelt oppholdsrom med en ekstra dag seng, et kjøkken / spisestue med utsikt over Kotor-muren og båtene som seiler av. Interiøret i huset følger en tradisjonell middelhavsstil med gamle steinvegger og trebjelker kombinert med moderne design og et nautisk tema i en symfoni av grå, taupe og blå farger. Fasiliteter inkluderer aircondition, full internett, DVD-spiller, gryter, panner, servise, bestikk, sengetøy og håndklær. Great renovated stone house on 3 floors, literally across road from the bay. Great views across the bay to Kotor old town from the kitchen dining area and bedrooms - cruise liners docking most days was an interesting sight. Very clean and well maintained with all the amenities we needed for a great self-catering week and a good base for touring around Montenegro. very good, modern and new en-suite shower/toilet rooms for each of the bedrooms on the second and third floors. Steepish stairs to the bedrooms and showers/toilets so not for those who might find stairs a challenge. Approx 15/20 minutes walk to the old town of Kotor along quite a narrow and moderately busy road - we walked it nearly every day and sometimes twice. Parking available nearby on a first come first served basis but we never really had any difficulties. Small store within 150 yards (selling good range of basics) open from dawn to long after dusk and small pub a little further on. Other pubs within 15 minutes walk. Very relaxing worry-free week! Great location with extraordinary views! We loved our stay at this property. The property was within reasonable walking distance from the town of Kotor but if we didn't fancy walking it was only €2 for a taxi. We were a group of four adults and there was plenty of space for us. The kitchen was great and we used a couple of times during the week to enjoy a meal in. The views from the property were extraordinary, I could stop looking and every time I did I found something new to catch my attention. The local area gives plenty of choice for walking and if your are interested in history there is a good walk to the top of the hill to the rear of the property that takes you to a well preserved fort. We would definitely stay at this property again should we get the opportunity to return to the Kotor area. The stone cottage is an adorable home nestled between the other stone houses that stretch along the road from Kotor, Montenegro. It is beautiful and quiet. Steps leading to the upper two floors of bedrooms and bathrooms are dangerous; narrow, steep, uneven and without a handrail. Lighting in bedrooms is virtually non-existent. Otherwise, it is a pleasant, accessible and well furnished. The house equipment and location were to our entire satisfaction. Beautiful house decorated with a lot of taste. Welcome by owner representative was perfect. She is reacheable at any time. I will recommend rental of the house to anyone. We could easily find a parking close to the house. Location out of Kotor is fine. 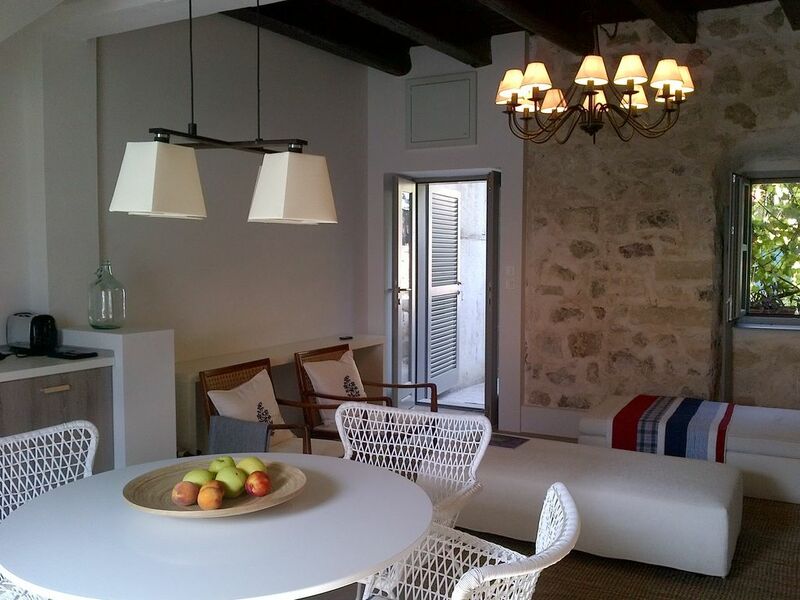 The house is located at an easy distance to Kotor which has a stunning walled city and amazing restaurants . Communication was excellent both from England and when we arrived in Kotor and advice on getting around was helpful too. A wonderful stay! Muo is a lovely part of Kotor Bay, and we felt at home at this property! My family enjoyed a nearly two-week stay at this property and loved it! We wanted a place that would feel like home, with good common spaces where we could share meals and board games and conversation in addition to our exploration of Kotor Bay and day trips visiting other parts of Montenegro. We were very happy with this house! We loved gathering downstairs in the open kitchen/living room area. We really liked being based in Muo, which was a lot quieter and less touristy/developed than Kotor or other parts of the Bay. And the views from the house, particularly the first and second floors, were great. We enjoyed our walks "into town" when we visited Kotor's Old Town. We had a car and parking was never a problem! There was a great little market just a few doors down and larger markets within easy walking distance (or even easier driving distance!). We had great communication before and during our stay with Nigel and Anka and her team. Would recommend this property! Kotorbukta er en solrik fjorden i Adriaterhavet, rik på naturlig skjønnhet og historiske steder som Kotor, Perast og Stoliv. Den lokale arkitekturen er vitnesbyrd om en ærerik historie. Først under gresk, romersk, tyrkisk og venetianske innflytelse, regionen ble senere en del av den russiske og den østerrikske imperier. Høye grønne fjell kommer til på trange strendene på den klare blå vannet i havet i et vakkert dramatisk natur. Ni svært små øyer med sine gamle kirker gi bukta en unik karakter. I sommer ulike marinaer rundt fjorden er befolket med elegante yachter samt tradisjonelle fisker båter. Den nye utviklingen av Portomontenegro med sine elegante butikker og livlige restauranter er bare en fem minutters kjøretur fra Kotor. Stedet kan være veldig hyggelig av sesongen også, med en temperatur noensinne neppe under 10-12 grader C om vinteren.